Hat Ihr Beruf mit der Informatikausbildung zu tun, dann sind Sie ein Schritt vor Optimierung Ihres Diensleistungsangebots! Fall Sie ein Ausbildungsträger sind, ein eigenes Unternehmen führen oder im öffentlichen Sektor arbeiten und sich für die Lehre von Internet Explorer und MS Outlook (2016-2013-2010-2007-2003, Express) oder Live Mail im Grundniveau interessieren , dann sollten Sie das meist verbreitete Programm zum Erlernen von Office-Anwendungen einsetzen. Diese Version enthält 263 Live in ates und 227 Quiz Fragen, die Ihnen dabei helfen werden ein Informatikzertifikat zu erlangen und sich mit dem Prüfungsprozess vertraut zu machen. 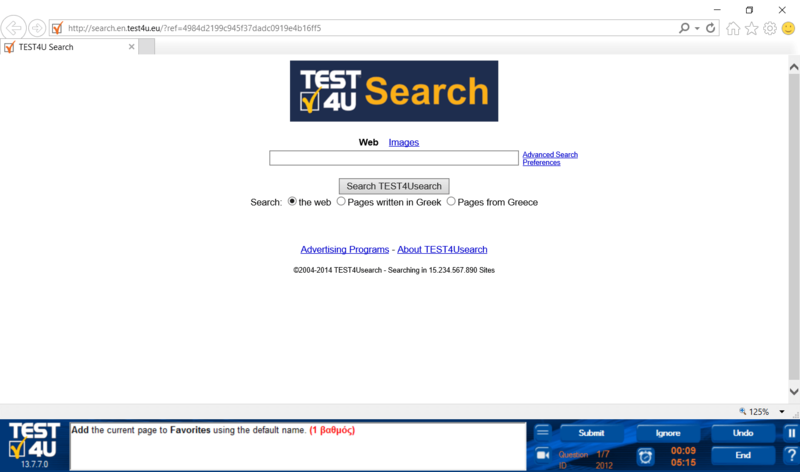 Installieren Sie die Internet Explorer & MS Outlook 365, 2019, 2016 2013 2010 2007 2003 Test mit Tests und Aufgaben zum Üben. 1.1.1. Understand the terms: Internet, World Wide Web (WWW), Uniform Resource Locator (URL), hyperlink. 1.1.2. Understand the structure of a web address. Identify common types of domains like: geographical, organisation (.org, .edu, .com, .gov). 1.1.3. Define the term web browser. Identify common web browsers. 1.1.4. Outline different Internet activities like: information searching, shopping, learning, publishing, banking, government services, entertainment, communication. 1.2.1. Recognise ways to protect yourself when online: purchase from secure reputable websites, avoid unnecessary disclosure of personal and financial information, log off from websites. 1.2.2. Define the term encryption. 1.2.3. Identify a secure website: https, lock symbol. 1.2.4. Define the term digital certificate. 1.2.5. Recognise options for controlling Internet use like: supervision, web browsing restrictions, download restrictions. 2.1.1. Open, close a web browsing application. 2.1.2. Enter a URL in the address bar and go to the URL. 2.1.3. Refresh a web page, stop a web page downloading. 2.1.5. Open a web page in a new tab, new window. 2.1.6. Open, close tabs, windows. Switch between tabs, windows. 2.1.7. Navigate between pages: backwards, forwards, home page. 2.1.9. Complete, submit, reset a web-based form. 2.1.10. Use a web tool to translate a web page, text. 2.2.1. Set the web browser home page. 2.2.2. Understand the term pop-up. Allow, block pop-ups. 2.2.3.Understand the term cookie. Allow, block cookies. 2.2.4. Use available help functions. 2.2.5. Display, hide built-in toolbars. Restore, minimise the ribbon. 2.2.6. Delete history, temporary internet files, saved form data. 2.3.1. Add, delete a bookmark / favourite. 2.3.2. Show bookmarks / favourites. 2.3.3. Create, delete a bookmarks / favourites folder. Add web pages to a bookmarks / favourites folder. 2.4.1. Download, save files to a location. 2.4.2. Copy text, image, URL to another location like: document, e-mail. 2.4.3. Preview, print a web page, selection from a web page using available printing options. 3.1.1. Define the term search engine and name some common search engines. 3.1.2. Carry out a search using a keyword, phrase. 3.1.3. Refine a search using advanced search features like: exact phrase, date, language, media type. 3.1.4. Search a web-based encyclopaedia, dictionary. 3.2.1. Understand the importance of critically evaluating online information. Understand the purpose of different sites like: information, entertainment, opinion, sales. 3.2.2. Outline factors that determine the credibility of a website like: author, referencing, up-to-date content. 3.2.3. Recognise the appropriateness of online information for a particular audience. 3.3.1. Define the terms copyright, intellectual property. Recognise the need to acknowledge sources and/or seek permission as appropriate. 3.3.2. Recognise the main data protection rights and obligations in your country. 4.1.1. Understand the concept of an online (virtual) community. Identify examples like: social networking websites, Internet forums, web conferencing, chat, online computer games. 4.1.2. Outline ways that users can publish and share content online: blogs, microblogs, podcasts, images, audio and video clips. 4.1.3. Recognise ways to protect yourself when using online communities: apply appropriate privacy settings, restrict available personal information, use private messaging when appropriate, disable location information, block/report unknown users. 4.2.1. Define the term Instant Messaging (IM). 4.2.2. Define the terms short message service (SMS), multimedia message service (MMS). 4.2.3. Define the term Voice over Internet Protocol (VoIP). 4.2.4. Recognise good practice when using electronic communication: be accurate and brief, use clear subject headings, do not inappropriately disclose personal details, do not circulate inappropriate content, spell check content. 4.3.1. Define the term e-mail and outline its main uses. 4.3.2. Identify the structure of an e-mail address. 4.3.3. Be aware of possible problems when sending file attachments like: file size limits, file type restrictions. 4.3.4. Outline the difference between the To, Copy (Cc), Blind copy (Bcc) fields and recognise their appropriate use. 4.3.5. Be aware of the possibility of receiving fraudulent and unsolicited e-mail. Be aware of the possibility of an e-mail infecting the computer. 4.3.6. Define the term phishing. 5.1.1. Access an e-mail account. 5.1.2. Outline the main purpose of standard e-mail folders: Inbox, Outbox, Sent, Deleted / Trash Items, Draft, Spam/Junk. 5.1.4. Enter one or more e-mail addresses, distribution list in the To, Copy (Cc), Blind copy (Bcc) fields. 5.1.5. Enter an appropriate title in the subject field and enter, paste text into the body of an e-mail. 5.1.7. Send an e-mail with, without priority. 5.2.1. Open, close an e-mail. 5.2.2. Use the reply, reply to all function, and identify when these should be used. 5.2.4. Open, save a file attachment to a location. 5.2.5. Preview, print a message using available printing options. 5.3.1. Use available help functions. 5.3.2. Display, hide built-in toolbars. Restore, minimise the ribbon. 5.3.3. Create and insert a text e-mail signature. 5.3.5. Recognise e-mail status as read, unread. Mark an e-mail as read, unread. Flag, unflag an e-mail. 5.3.6. Create, delete, update a contact, distribution list / mailing list. 5.4.1. Add, remove message inbox headings like: sender, subject, date received. 5.4.2. Search for an e-mail by sender, subject, e-mail content. 5.4.3. Sort e-mails by name, by date, by size. 5.4.4. Create, delete an e-mail folder/label. Move e-mails to an e-mail folder/label. 5.4.5. Delete an e-mail. Restore a deleted e-mail. 5.4.6. Empty the e-mail bin/deleted items /trash folder. 5.4.7. Move a message to, remove a message from a junk folder. 5.5.1. Create, cancel, update a meeting in a calendar. 5.5.2. Add invitees, resources to a meeting in a calendar. Remove invitees, resources from a meeting in a calendar. 5.5.3. Accept, decline an invitation.